The Prince Edward Award for Excellence in Horticultural Career Development is a new award intended to highlight real excellence in the field of horticulture. It focuses largely, but not exclusively, on Horticultural Education and Career Development in the widest sense and it is given to individuals and organisations that do not fall within the existing formal educational establishments. His Royal Highness Prince Edward agreed that each year a carefully researched candidate would be presented to him, with supporting rationale, to be considered for this prestigious award. Generally such candidates will be individuals or enterprises which offer innovative and effective ways of motivating people to take up horticulture as a career. They will facilitate the advancement of individuals in their chosen horticulture fields, provide excellence in career development or simply be seen as inspirational. The first winner, in 2014 was Jody Scheckter (former Formula 1 World Champion) and his wife Claire of Laverstoke Park in Hampshire. They have created a farming, vegetable, fruit and food production centre that focuses on natural growth and a connection with the environment in order to produce a sustainable model of horticultural production. They have invested heavily in bringing education in their ways to the children of the county and they run an extraordinary educational centre in the park that has already touched the lives of several thousand youngsters. In 2015 the trophy went to Raymond Blanc, the principal behind the development of “Le Manoir aux Quat' Saisons” in Oxfordshire, an extraordinary restaurant of international fame. Raymond has dedicated huge resources to the development of natural and organic gardens there which sustain the needs of the restaurant and bring fresh organic quality food to the table. This process he has developed into a training establishment for budding growers and chefs which provides stimulation, excitement and a different vision for many who might never consider this route to horticulture. 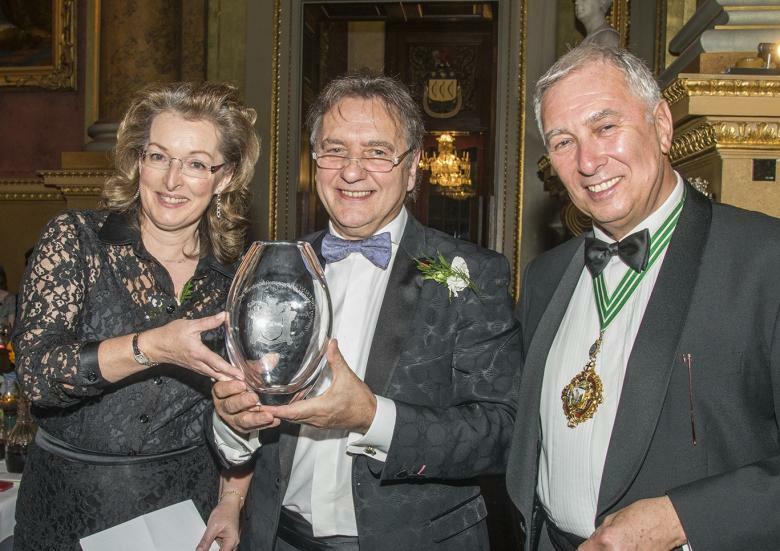 Raymond Blanc receives the 2015 Prince Edward Award for Excellence in Horticulture from Clare Scheckter (joint winner with her husband Jodie in 2014) and Master Stephen Bernhard.